Jeannie took office as Clermont County Treasurer in September 2017. As County Treasurer she serves as the Chief Investment Officer for the County and is a member of the County Budget Commission, County Board of Revision and Automatic Data Processing Board. Jeannie, prior to becoming County Treasurer, was a member of the Treasurer’s Office staff since 2007, working with delinquent taxpayers. Before joining the Treasurer’s Office, Jeannie worked primarily in law firms and title agencies preparing and closing real estate loan transactions. She also operated her own bookkeeping business for several years. 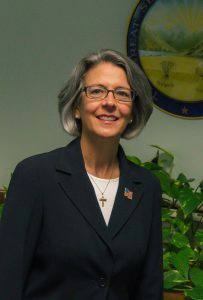 She served as Executive Treasurer of the Clermont County Agricultural Society from 2003 to 2013 and was a member of the Jackson Township Board of Zoning Appeals from 2003 to 2017. A graduate of Batavia High School in 1979, she obtained a Degree in Accounting from University of Cincinnati, Clermont College, in 2015 and received Outstanding Accounting Technology Student Honors.